Kareem Hunt is one American footballer who defied all odds to climb to the top of his game and is today numbered among one of the best players of American football. Hunt’s career is still in its infancy but has shown signs of great things to come in the future. Here, we will look at his profile, find out what team he plays for and how he was able to stand himself out amidst a pool of competing talents. 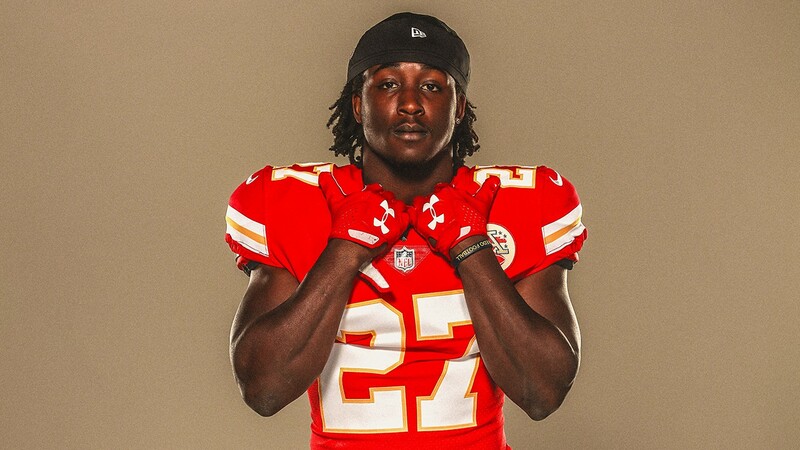 Kareem Hunt is not older than those born in the year 1995 as he was born in the same year on August 6 in Willoughby, Ohio to Stephanie Riggins (mother) and Kareem Hunt (father). As he came of age, Kareem was enrolled at South High School in Willoughby, Ohio, where he began playing football with his school team called “Rebels.” His high school career saw him rush a total of 2,519 yards with 39 touchdowns as a junior, while in his senior year he improved in both with 2,685 yards rushed and 44 touchdowns. Rivals.com rated him as a three-star recruit by the end of his senior year. Kareem then set out for the University of Toledo where he enrolled in 2013 to pursue his college football career. In the college, as a freshman, he played 12 games from which he had 3 starts and recorded a total of 866 yards rushed on 137 carries with 6 touchdowns. In Kareem’s sophomore season, he played 10 games and missed three due to injury. For the games he played, the lad recorded a 101 yards rushing. His 217 rushing yards with 5 touchdowns in the 2015 GoDaddy Bowl victory over Arkansas State Red Wolves Football team of Arkansas State University saw him emerge as the Most Valuable Player of the tournament. His 2015 season started off on a rather dismal note as he violated team rules which came with a suspension from their first two games of his junior year season. By the time Kareem Hunt was fielded for their third game of the season and his first, he picked up an injury which saw him ineligible for another two games and the season ended with him performing poorly when compared to the previous season. Kareem Hunt in his college days. Nevertheless, Kareem Hunt picked up form and was in top shape for the 2016 season where he played 13 games with 262 rush attempts and 1, 475 rushing yards. He had an impressive last college season and was sure to be picked in the 2017 NFL Draft. The lad was drafted by the Kansas City Chiefs as the 86th overall pick in the 3rd round of the 2017 NFL Draft. He was the first of three players from his college to be selected and the 6th running back to be picked in the draft. Hunt found a place in the first team due to a knee injury their first choice running back Spencer Ware sustained in their third game of the season. Thus, he saw his first NFL action in a game against one of the league’s best teams – the New England Patriots on September 7, 2017. The Chiefs came out tops in the game with a 42–27 victory out of which Kareem had 148 rushing, 98 receiving (246 total yard scrimmage) which was the first in an NFL debut for any player ever. He continued his impressive form in the league by leading as the highest rusher in the first week. Kareem was highly instrumental in his team’s victories against the Philadelphia Eagles and the Los Angeles Chargers which saw to his being named as the AFC Offensive Player of the Month (September) with 401 rushing yards, 538 yards from scrimmage, and 8.53 yards per carry. The Toledo Rockets product would then be named to the 2018 Pro Bowl as a rookie on December 19, 2017. He still plays for the Chiefs and will steadily improve his game there. Kareem Hunt stands at 5 feet 10 inches or 1.78 m with a body weight of 216 lb or 98 kg. In the cradle of his career, he was named to the Second-team All-MAC (2015) and two times in the First-team All-MAC (2014, 2016). Hunt was listed in the PFWA All-Rookie Team, NFL rushing yards leader (2017). He has a girlfriend who goes by the name Julianne Orso, the two reportedly met when they were students at the University of Ohio. Though his net worth is not yet known, his salary has been quoted as $465,000.